You are here: Home / Dogs / Ollie gets dragged through the fence! Ollie gets dragged through the fence! Ollie was sniffing around his yard when he heard another dog outside. So, being an inquisitive sort of canine he stuck his nose through a hole in the fence to have a smell of the new comer. Unfortunately the new comer was not as friendly as Ollie had hoped. It was a cross bred who was not very well mannered and proceeded to grab the newly exposed bit of Ollie’s nose and pull him through the fence. 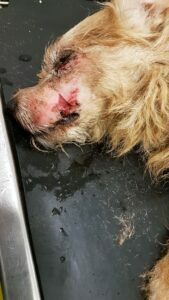 Ollie was very lucky in that he could pull himself back through the hole with the help of his owner and he was safe. 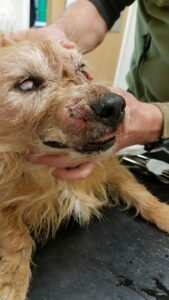 When he came to us he had a cut under his left eye, his lip was torn through on the left side and he had puncture marks on the right side of his nose. 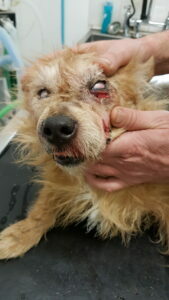 Under anaesthetic we clipped and cleaned the area and stitched the lip and eye wounds. Dog bites always inject bacteria under the skin so Ollie had to go home with antibiotics and pain killers. he has since made a full recovery. 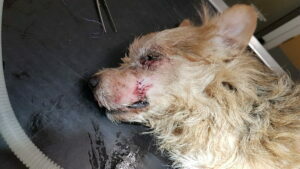 Both Ollie and his owner were lucky, dogs that get attacked in the open often cannot escape and can end up with horrible injuries (and even be killed). There is also the risk of humans getting badly bitten and requiring hospital treatment if they try to separate the fighting dogs. Of course it is human nature to try and rescue our dogs. 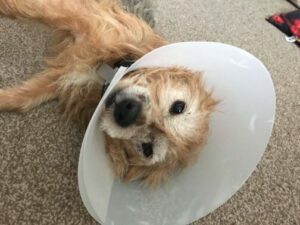 often the dog that is attacked is a friendly, trusting animal and there can be lifelong psychological changes to dogs that have been attacked. Early socialisation and firm training will nearly always stop a dog being aggressive. If an owner has any suspicion their dog is aggressive to other dogs they have a duty of care to make sure their dog is exercised safely, either by keeping it away form other dogs, keeping it on a lead or even using a muzzle when the dog is out and about. https://www.withygrovevets.co.uk/wp-content/uploads/2018/03/IMG-20180315-WA0002.jpg 378 504 Michael Clarke https://www.withygrovevets.co.uk/wp-content/uploads/2019/04/Withy-Grove-logo2.png Michael Clarke2018-03-15 14:42:272018-03-28 14:08:20Ollie gets dragged through the fence!